For more than 18 years Jason Lenox has proven his keen eye for rustic interiors as the proprietor and buyer of Antèks. Jason has built the Design District store to be a beacon for discerning consumers of rustic furnishings and accessories. Hammered copper flatware, a Cattle baron carved chair and handwoven Soumak rugs attract not only the ranch or lodge owner but the downtown dweller of a chic high rise. The unique collection can easily outfit an entire interior or serve as the perfect accent. Now included in his coveted accessories is a vintage collection of flags and other decorative items featuring a patriotic bent. Always on the hunt for unique pieces Jason discovered a 48 star American flag in early 2011. Appreciating the flags condition and historical nature, along with his innate sense of patriotism, he was inspired to acquire more. After a twelve month journey Jason had accumulated 25 one-of-a-kind items. 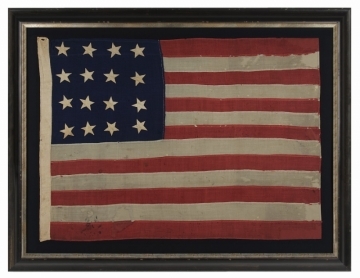 These rare findings include three original 48 star flags, needlepoint, posters, plates, etc. to commemorate the evolution of the US flag. The pieces are currently being set in sophisticated frames and will be considered wall art. The patriotic collection made its debut on Friday, June 22nd and will be showcased through July 4th and beyond at the store. With more than a desire to channel his patriotism through design, a percentage of proceeds from each sale within the unique collection will benefit Wounded Warrior Project. Wounded Warrior Project™ (WWP) serves military service members who incurred service-connected wounds, injuries or illnesses on or after September 11, 2001 and their families. Jason hopes he brings more meaning to the elements of design by offering inspiration to the rooms that encase these historic findings as well as the military service members they benefit. About Antèks Home Furnishings: After 30 years in business Antèks is a national leader in upscale rustic home furnishings and accessories. Proprietor and buyer Jason Lenox runs the elegant storefront located within the Design District of Dallas, Texas. Respected by interior designers and the public, the store strives to keep the rustic lifestyle sophisticated, fresh and current. Anteks is located at 1135 Dragon Street, Dallas, TX 75207; 214.528.5567, Mon-Sat 10 am - 5 pm; www.antekshome.com.